Brigadoon basically. 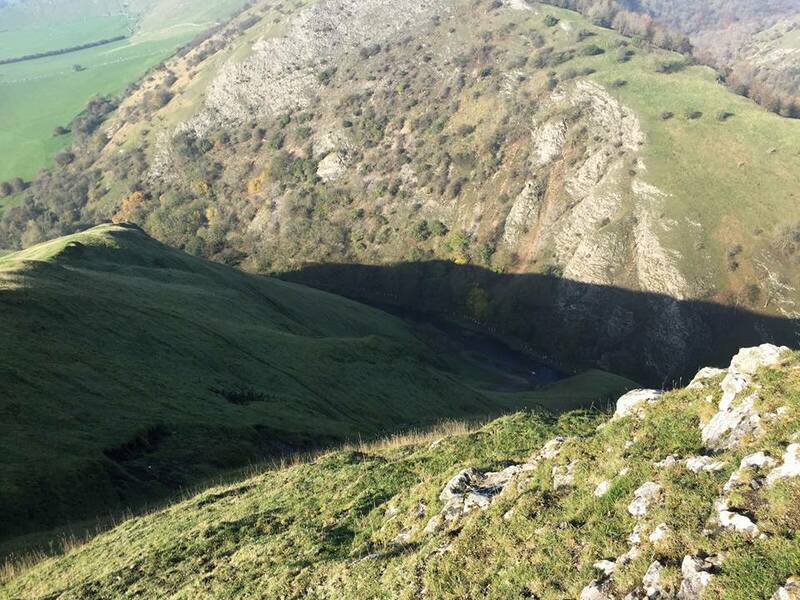 That seems to be the location for the Dovedale Dash. You know where I mean? That remote Scottish village in the highlands that appears from the mist for one day every one hundred years? Well, that’s sort of like my experience of getting to the Dovedale Dash. It is a gorgeous setting for an off-road race, but it wasn’t easy to find through the near impenetrable fog that we had to navigate through from Sheffield to get there. I can only assume it emerges from the mist annually, just for this cross country race that has become something of a local tradition, only to disappear again for another 364 days afterwards. So, what possessed me to sign up for another off-road challenge? Well, we all have different motivations for running. For me, any number of factors could potentially have drawn me in: the glory of the great outdoors; building on my experiences at both the Wingerworth Wobble and the Endurer Dash; the need to exorcise my unfinished business with trails and waterways and navigation. In actual fact, the most compelling factor in deciding to run, was the offer of a lift from someone else who was definitely going, with the added incentive of getting to meet her new squeeze who seemed to be up for coming along for the ride. Curiosity may have killed the cat, but nosiness got this woman running, running scared, granted, but running all the same. 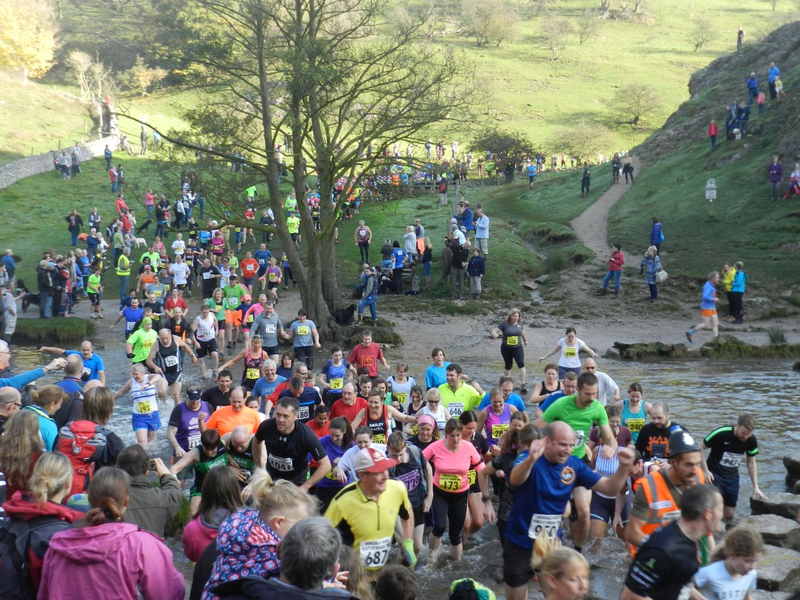 The Dovedale Dash is a cross country race of 4 3/4 mile, run by 1200 to 1400 people of all abilities. 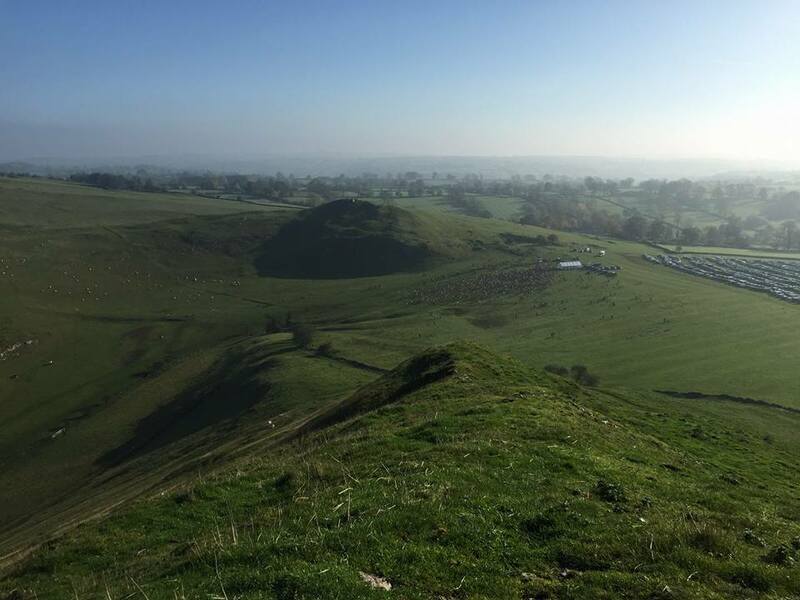 The venue is the picturesque area around the village of Thorpe near Ashbourne and Dovedale in the south of the Derbyshire Peak District. 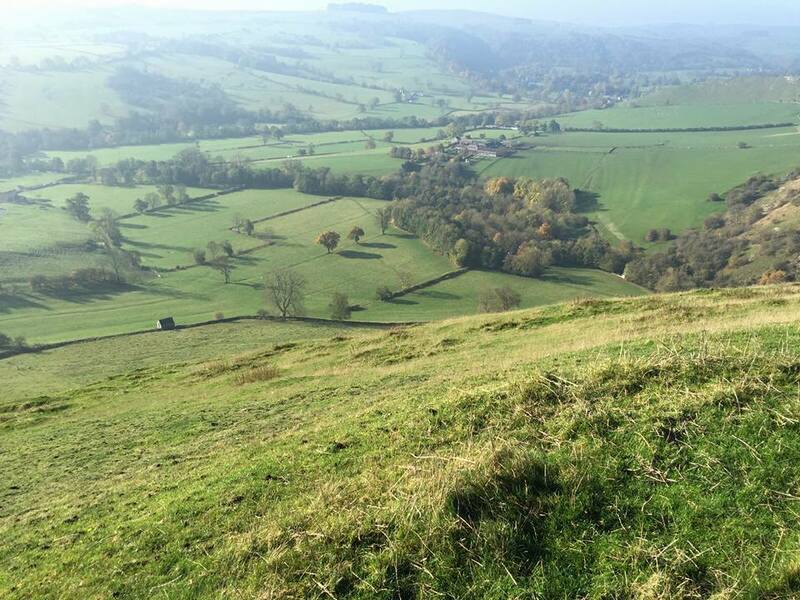 The course is mainly along field paths and open ground in the valleys of the river Dove and Manifold. One of the excitements is the crossing of the rivers Dove at the well known Stepping Stones. As is my usual race routine, I didn’t really give the matter a great deal of extra thought beyond having agreed to go. I read in a recently passed on copy of Women’s Running Magazine, that sleep is a very important part of training. Why would anyone risk sleepless nights of stressful angst considering what it is you are about to undertake, when you can hide under a duvet ignoring the inevitable and hoping it might go away? I did short drive to rendezvous with another running buddy, and together we went round to our designated Driver for the day. I sat in the back as although I can get a bit car sick, the other passenger looked more likely to heave en route. Travelling in the back of a car as an adult is weird. I automatically revert to child mode. Eavesdropping on the grown ups in the front seat whilst staring at the back of the headrest in front, and going suddenly quiet, like a budgie that’s had a tea-towel chucked over it’s cage. There were hints of loveliness as orange, red and gold covered trees emerged from mist, and occasional shafts of morning light shone through like spotlights, however, as we drove onward the mist deepened and pretty soon it became actual fog, and I was really glad I’d got my long-sleeved top with me as well. 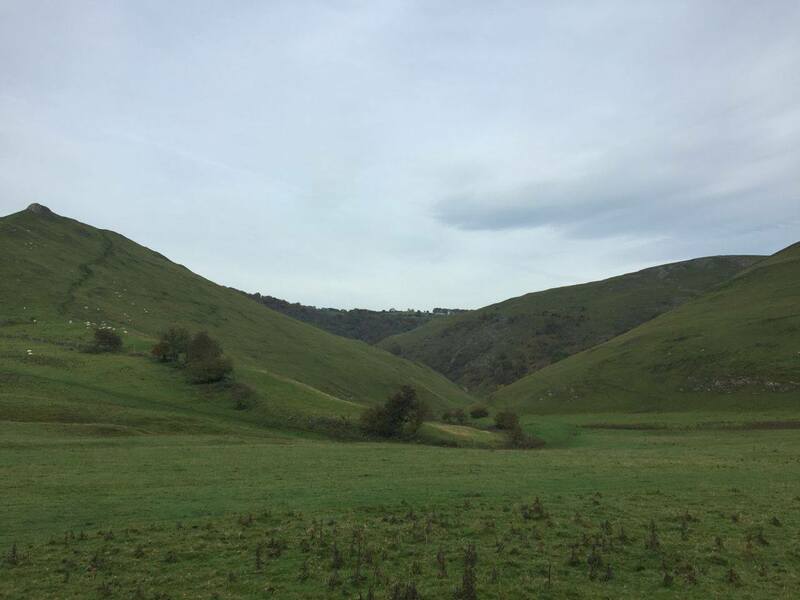 We scooped up sleep-deprived partner of driver on the way, and wended our way towards Dovedale. We must have got into some sort of dip, because it was seriously poor visibility now ‘I hope we don’t have to navigate on the hills’ observed our most experienced fell runner. Oh crap. That had never even crossed my mind! 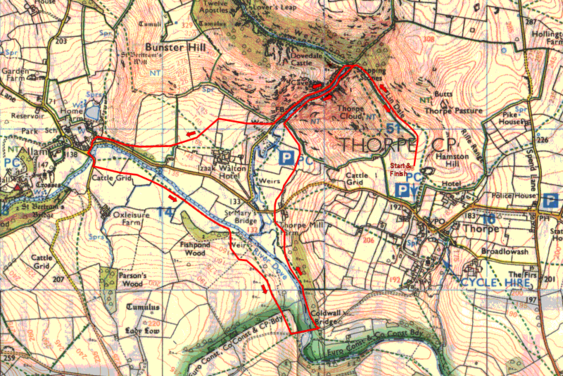 Given how lost I got following a trail that was set out by someone who claimed that they came from the perspective of someone who needs satnav to get upstairs in their house (wobbling round Wingerworth), I didn’t fancy being lost in the hills of Derbyshire until same time next year when the route re-appeared. I could feel my nerve failing, and as we started to think we were lost, circling endlessly roads that were surely near the start but seeing no actual sign of it, I began to think abandoning the whole idea in favour of a pub lunch really wasn’t such a bad alternative option to pursue. We did find the start. Signs to the car park and suddenly it was like we’d got to a country agricultural show. Huge fields set aside for cars, efficient attendants waving us in, a little trio of portaloos (no queue, that can’t be right) and a slide across some wet grass to get parked. Ooh, and LOTS of people. Where did they all come from. I think I immediately swopped into my long sleeved top, finding that I’d already lost two of my four magnet pairs during the drive to get there. Bit disappointing, but I was in possession of some emergency safety pin supplies so all was not lost. After a brief marvel at the distinctive conical hill we traipsed over to a white marquee to register. You can only register on the day, and we’d expected this to be a bit chaotic. It was not. It was genius, the most seamless registration ever. They’d written in bold letters on the canopy of the tent which queue was which (adult female, adult male, children’s race whatever) and you simply turned up, handed over your fiver, scribbled your name and club (no emergency contact details required – presumably a few lost runners aren’t a big issue when you have up to 1300 taking part, and the organisers can’t be really held accountable if the venue is going to disappear back into the mist in a couple of hours anyway). The whole thing only took a couple of minutes. The three of us delightedly admired our numbers. It was magical. Almost at this very moment the sun burst through, and the landscape emerged in all it’s magnificence. I also got a bit of a heads up on the tricks employed by more elite runners. I am prepared to share at least one with you because it is genius, and as far as I am aware not bound by the same secrecy codes as say the Magic Circle. Basically, you get your number and … stay with me, it is counter intuitive but it will be OK .. you scrunch it up into a little ball! No really! It sounds weird, and indeed on witnessing my companions doing this I did feel it looked like sacrilege of some sort, but it’s a very clever tip. If you do this, pre-crease your number, it keeps it flatter against your body, so it doesn’t billow out in the wind when running. Now I can’t be sure if the tip is to help you be more aerodynamic in terms of speed, to prevent number loss whilst running, or just an aesthetical precaution, but it was pretty splendid to be let in on the club. I too scrumpled my number with gusto before securing it in place with remaining two magnets and a couple of safety pins. 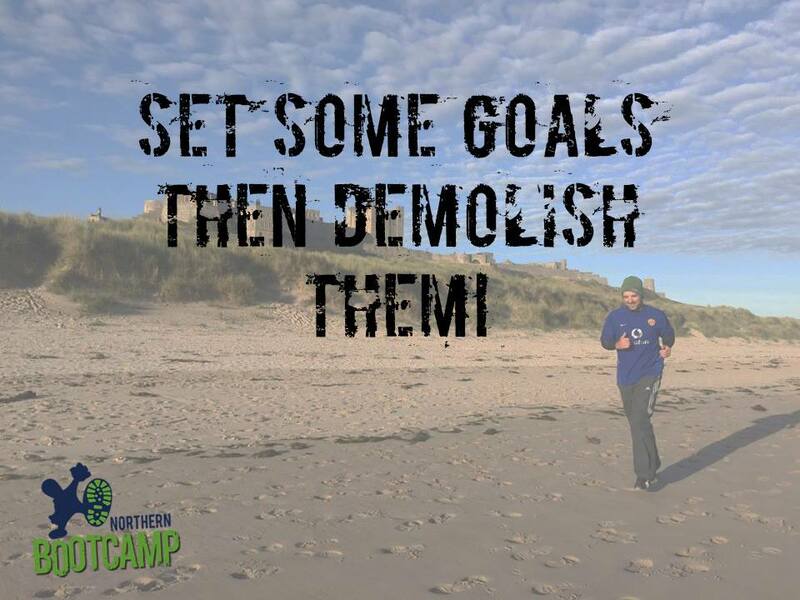 As I did so I looked pityingly across to the more amateur runners who were trying to keep their numbers all neat – such ignorance and inexperience, still one day they too will learn for themselves. What a great day for them that will be. We spent a bit of time watching the children’s race . These were seriously impressive kids. There was enthusiastic, and rather personal, announcements giving a run down of the finishers as they approached the line. I don’t know in what capacity the woman giving the excellent and exciting commentary knew them all. Possibly a school teacher (‘little Sky spent three years with me’) but she might have been a child snatcher that they were all running away from which is why they appeared to sprint so darned fast. They were amazing. Some were only four or five year’s old, and yet donned in onesies they charged up a steep hill directly into the sun through a cheering throng of supporters. Some got a bit lost at the end, confused by the crowd, diverging path and disorientating bright sun, they stumbled off in all directions, only to be shepherded back towards the funnel by benign observers. I genuinely felt quite emotional watching it. The determination of the runners, the people watching willing them to success and the sheer unadulterated innocent joy of it all was fabulous to behold. Even so, we got a bit bored eventually and went off to the loos, which by now did have a pretty substantial queue. Then back to the car, where I had to change out of my long sleeved top and back into my short-sleeved one again, and we took time to have our photo together. It is only on seeing the photo afterwards that I come to concede the deely-boppers may have been a mistake. My running buddy maintains they do aid with identification, but I’m thinking maybe some sort of standard like they used to carry in Caesar’s army might be better. We could then also have left it by the car so we wouldn’t have had to spend 15 minutes racing up and down all the lines of vehicles trying to find it later on, when we all went back to the car to change ready for the race and realised not one of us had remembered where it had been parked.. There was still a bit of time, so we had a look at the course map and then chatted to a few other Smileys who were also there which was a nice surprise. I had to have another precautionary pee, and in the queue met someone who knows someone in Smileys so that was companionable. I then joined the Smiley cohort at the start. One shared another top tip known by experienced runners. Rather than queuing for the loo, earlier on she had taken the opportunity to head off to the hedgerows, but (and this is the clever bit) not wishing to bring her running club into disrepute if spotted, had pulled her Smiley vest up to cover the name before relieving herself. She did get her arse stung by nettles though, so I’m not quite sure she has perfected the art to be honest, but still a technique to emulate in principle. Crazy stampede of 1300 at the start! At the base of the hill there’s a left turn and it evened out a bit, but you still had to scramble over the ground as the path, such as it was, was muddy in places and anyway, too narrow to accommodate everyone. You can hear shrieks ahead as people encounter The River. Charmingly, the race notes tell you that this is known to be the coldest river in Derbyshire. Oh joy. In sight of the crossing you can see hoards of people on the banks, some with cameras and mobile phones held high in order to record the inevitable carnage that follows. I’ve used the analogy before, but really and truly, you do feel like part of a herd of wildebeest crossing a river on migration, not all of you will survive, but through simple dint of numbers the majority surely must. It is survival of the fittest, some will be picked off by crocodiles or currents, but others will overcome. 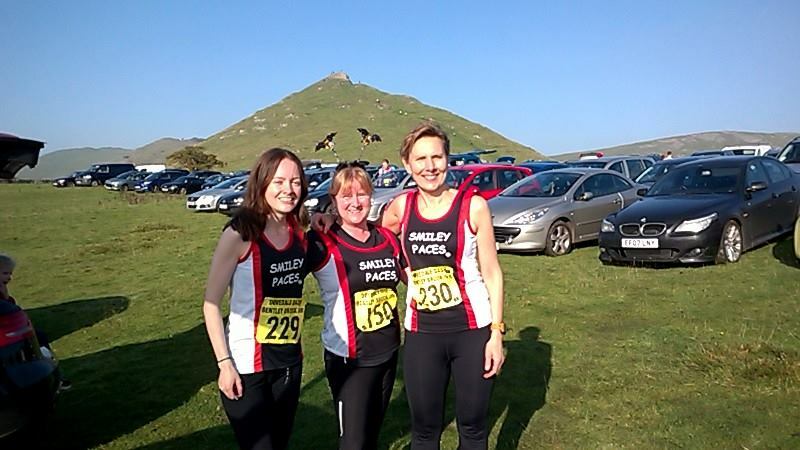 In fact, looking at the quite brilliant YouTube video of the event (search Dovedale Dash 2015 for yourself, I’m not risking falling foul of their broadcasting fee), you also see a few acts of selfless humanity. Runners stopping to heave out a fallen comrade, or people at the bank hauling a distressed dog out of the waters before runners and dogs alike squelch off and away again. There is definitely an element of relief at having survived the river crossing, and this does temporarily distract from the fact that you’ve now got to run the rest of the route with your shoes full of water. You can hear the sploshing of other runners feet around you. The water was cold, but strangely it makes you feel great when you come out the other side. Also, it wasn’t too deep, so no wet knickers, well not from the river crossing anyway, I can’t promise a few people hadn’t already wet themselves in terror at the start. It’s so hard to describe the route. It was gorgeous, very muddy in places, sometimes way too muddy to run at all, you just had to pick your way through. 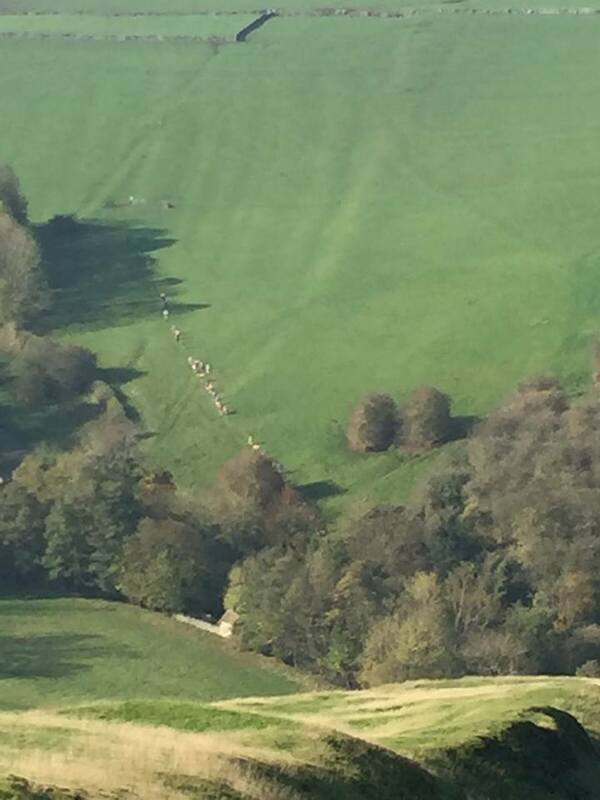 We went through fields with cattle and young calves that seemed unphased by the runners hurtling by. We passed through a village at one point where people on the bridge clapped encouragingly as I went by. There were a few snatched conversations with other runners, groups in fancy dress, people commenting on my Smiley Paces top ‘are you running for charity?’ one enquired, clearly my expression hinted I couldn’t possibly be doing this for fun! I got used to seeing more ambitious runners skidding down slopes and ending up variously on their backs, faces or other runners, so I freely admit I ended up walking some of the more scary mudfest bits. Some bits were undulating grassland, other trails were rocky footpaths and there was a section along the river bed where you could splosh in and out of the water. That was quite a good idea because you could try and get rid of some of the mud that was by then accessorising shoes and legs way more than one might have wished. Feet of clay made manifest, it’s is really, really hard to walk, let alone run, when you have half the earth of Derbyshire cemented to your feet. The desire to cleanse my shoes was given an extra urgency because the one part of the course that brought real horror was a bit where you had no option but to pass through a gateway that even from a distance you could see was awash with liquid mud. I am pretty game for getting muddy, but plunging through the midst of this, and feeling the splash back that inevitably followed, it was obvious this was not just any mud, this was slurry. The real deal, l was awash with cow manure more than I expected or appreciated. I daresay it’s good for the skin, but that offered little consolation. Added to the horror of this was that I feared my trainers might be coming loose, but I didn’t really fancy reaching down to adjust them just at that moment. I’m not generally squeamish, happy to eat my sandwiches after mucking out some stables (horse or alpaca) without washing my hands, but this was a bit too much, it was the dripping I think, not nice. Oh, what the hell, it’ll be fine…. So sploshing onwards, it was great to emerge from the worst of the mud and back alongside the river where we’d originally crossed, even if it did mean we’d have to heave ourselves back up that hill, at least the end was in sight. It was a tough finish, you are running right into the sun, and with the mess of spectators it wasn’t at all clear where the end actually was – eventually a silhouetted figure called out to me ‘The end is nigh’ or possibly ‘the finish is here!’ I got confused. I headed towards the voice, and a friendly race marshal said ‘you’ve done it, it’s over!’ yay, I was so happy. There was a bit of a bottle neck into the funnel system, which had a queue that turned back on itself like that one in Shrek when donkey and Shrek are going into the theme park whose name I can’t remember. I was happy enough to dawdle at this point. In any case, inevitably all the other Smileys were home before me, so they were also waiting by the funnel. I filed through the funnel, got my number added to the list being produced by a clipboard holding official, grabbed a certificate, and joined the others. We had a few posing for photo moments, but I don’t know what happened to those shots, so you’ll have to just use your imagination for now until they catch up with me. 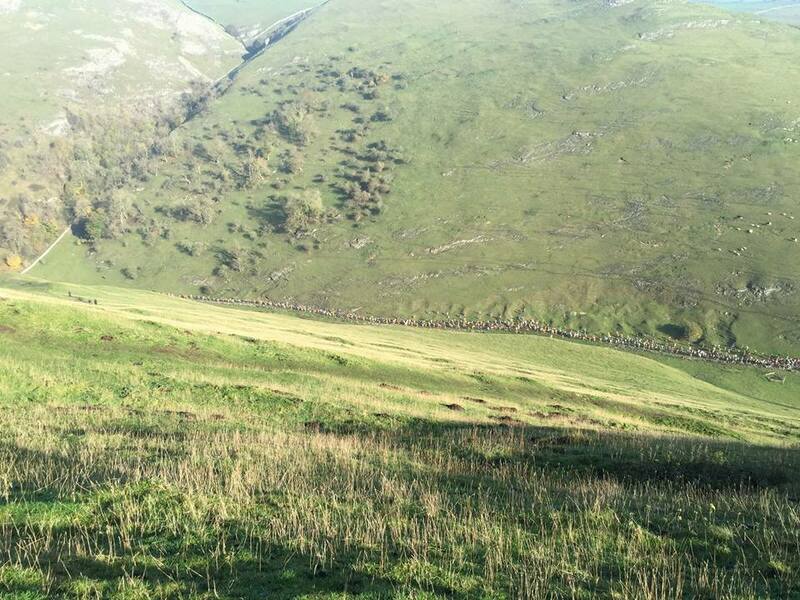 From my perspective the Dovedale Dash was a friendly if somewhat frenetic event, brilliantly organised, and I’m pretty sure they say somewhere in the small print that the sun always shines for the annual outing. They might have said that, or there might have been something about icebergs and hail, I can’t quite recall. Same time next year will be 6th November 2016, so put it in your diary. So after a bit of faffing, back to the car – a bit easier to locate second time around – we had the foresight to have brought a change of clothes with us, but did have a bit of bucket envy as we saw other runners had had even greater foresight and had gallons of water and washing basins in which to deposit their slurry encased footwear. We made do with plastic bags. The drive back was uneventful, and back in Sheffield my running buddy piled me up with home made sourdough as well as pear and chocolate cake so I could return to my flat and enjoy them both. I could not have felt more indulged if I’d been given a crate of Ferrero Roche in which to bathe. I did spend a great deal longer cleaning the mud off my trail shoes than I had actually running the race. It was worth it though. I stuck my shoes on the roof outside my attic window in order that they could dry in the sun. I then promptly forgot all about them until two days later when I retrieved them sodden with fog, rain and imbued with the scent of Autumn bonfires. Oh well, I’m sure they’ll dry out eventually …. Incidentally, I never shared with you my pre-event goal. This time my objective was to complete the run without losing my trail shoes in the mud en route. Reader, this I accomplished. Finally, my running is improving, I may yet reach future goals! Yup, this sounds like the race I did a couple of times 20-odd years ago. Loved it, especially leaping into/wading through the river. It’s only thigh deep but has some quite big loose rocks on the riverbed I wasn’t expecting first time. So I sprang from the bank, my foot landed on a rock that rotated and shifted, and I ended up under water, on my back, looking up at indistinct runners trying not to jump on my face. Just what a fun run should be! I loved it.